All teams have norms — not to be confused with gnomes! The tricky thing is that “norms” are often created without intention or accountability. Teams just form them and then its “norms” sometimes, and often tragically, lead to a less than high-performance team. 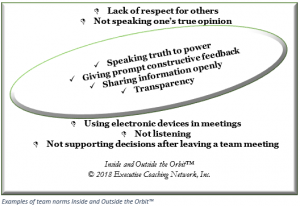 On the other hand, senior leadership teams that devote time to being conscious and accountable about their “norms”—for example through the Strategic Team Coaching® process—are able to intentionally direct behavior. When individuals are held accountable for being functional team members, there are higher levels of performance, trust, collaboration, and candor. How can your team foster an intentional set of norms that will deliver the desired behavior and create the right culture? Higher levels of trust on the teams. More satisfaction of team members; improved morale, and connection to the team and the organization. Increased retention of top performers. In a recent HBR article, 3 Ways Senior Leaders Create a Toxic Culture, Ron Carucci identifies scattered priorities, unhealthy rivalries, and unproductive conflict as the “toxins.” He recommends written norms to neutralize these toxins. We agree. I love the imagery Carucci uses in making the point that a leadership team’s behavior has an outsized effect on an organization’s culture: “Having your actions play out publicly, as if on a Jumbotron, is a huge responsibility, and unfortunately too many teams don’t take that responsibility as seriously as they should.” Norms are a good way to be intentional and accountable about a leadership’s behavior. Here are examples of what teams we have worked with have written Inside and Outside the Orbit. 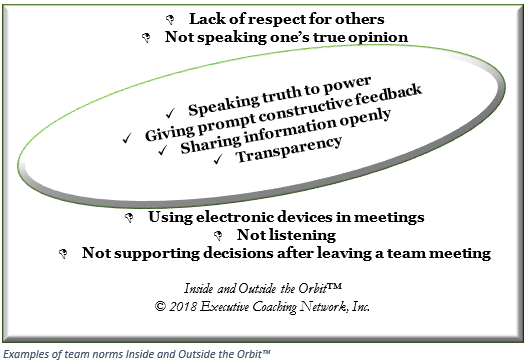 Come to agreement as a team and write down what is Inside and Outside the Orbit for your team. Review these norms often as a team. Refresh the norms periodically—keep them relevant. Has your team defined a culture that pays off for the team and the organization? Do you have a way to describe behaviors that are consistent or not in a way that is quickly understood by teammates?